English with Stick Mark Boom! To ensure progression across the Key Stages, for KS1, Lower KS2 and Upper KS2, there are three or four differentiated stickers matching the objectives for each age range. Self and peer assessment form a fundamental part of the SMB approach. Children evaluate their own work using the checklist boxes to tick or cross whether they feel they have met the success criteria. Following this, they should edit and improve their writing, using the success criteria sticker as a guide. The SMB success criteria stickers make teacher marking simple, quick and always constructive/developmental. Using the ‘Tickled Pink’ and ‘Green for Growth’ system, teachers highlight the success criteria sticker using pink or green to show whether the child has met that ‘Step to Success’. Our approach enables children to see exactly where and what they need to improve. 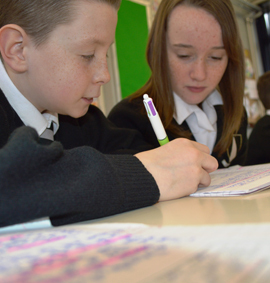 It also provides very visual evidence of progress – a key feature when assessing without levels. The range and explicit nature of the criteria enable a teacher to target their feedback at the appropriate level for that child, thereby personalising the learning experience. The SMB approach removes the need for extensive, handwritten comments. Feedback Friday Targets (FFTs) ensure parents and children receive regular feedback about progress. From Year 1 to Year 6 with modules for English, Maths, Science and Religious Education.